Investors restarted Wall Street's rally Tuesday, buying financial and homebuilder stocks following a surprisingly upbeat report on home construction. Major market indicators rose more than 2 percent, including the Dow Jones industrial average, which added nearly 180 points. The government's report that housing starts rose unexpectedly to an annual rate of 583,000 in February more than offset concerns over news that Alcoa Inc. is cutting its dividend and Nokia Corp. is laying off 1,700 workers. The construction report didn't signal the housing market is necessarily recovering but some traders saw it as the latest ray of good news that has brightened the mood on Wall Street in the past week. Stocks began rallying last Tuesday after Citigroup Inc. said it operated at a profit in the first two months of the year. Similarly upbeat assessments from other troubled banks and better-than-expected readings on retail sales have led some investors to believe the market has been too dour on the how bad the current economic situation really is. Stocks surged last week in a four-session rally that left market barometers up about 10 percent - the type of gains they might normally take a year to assemble. Buyers stepped in again Tuesday after stocks posted moderate declines on Monday. 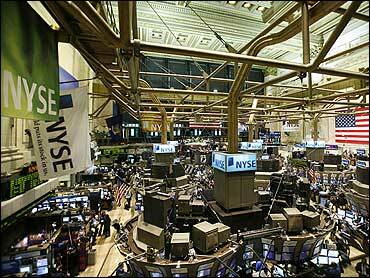 In preliminary calculations, the Dow rose 178.73, or 2.48 percent, to 7,395.70. Broader stock indicators also advanced. The Standard & Poor's 500 index rose 24.21, or 3.21 percent, to 778.10, while the tech-laden Nasdaq composite index rose 58.09, or 4.14 percent, to 1,462.11. The Russell 2000 index of smaller companies rose 8.73, or 2.3 percent, to 395.09. Five stocks rose for every two that fell on the New York Stock Exchange, where volume came to a light 916.3 million shares. Light volume indicates less conviction behind the market's moves. D'Arcy said technology companies could be getting an extra boost as investors move back into those stocks after they fell sharply Monday. The market has established a clear shift in tone over the past week. Jittery traders had blown apart earlier rallies in recent weeks by selling just as stocks managed to advance, and analysts are again cautioning that risks remain. An early rally from late November until the start of the year fizzled as worries grew about the tattered balance sheets at large banks and signs that consumers will pulling back on their spending. However renewed signs of balance in the economy since then have led investors to become more comfortable owning shares again. Tuesday's news on home construction gains in February came in well ahead of analyst estimates. Building permit applications, a key measure of future activity, also rose unexpectedly. "We could be in the very early stages of some kind of normalization" in housing, he said. Many economists say home prices have to stabilize before worried consumers will begin to increase their spending and the economy will begin to pick up speed. Traders snapped up homebuilder stocks following the report. Centex Corp. rose more than 5 percent, gaining 38 cents to trade at $7.27. Toll Brothers Inc. rose 66 cents, or 4.1 percent, to $16.77. Financial shares, which led the rally last week, also pushed higher. Banks have been hard-hit by souring mortgage debt so any pick-up in housing could help their balance sheets. Citigroup rose 10 cents, or 4.3 percent, to $2.43, while JPMorgan Chase & Co. rose $1.13, or 4.9 percent, to $24.22. The KBW Bank Index, which tracks 24 of the nation's largest banks, rose 1.3 percent. Investors are also awaiting the outcome of the Federal Reserve's two-day meeting that ends Wednesday. The central bank is widely expected to leave interest rates at their current historically low levels, but the market will be keen to see how the Fed sizes up the economy in its statement that accompanies the decision on rates. Alcoa became the latest of the 30 companies that make up the Dow Jones industrial average to lower its dividend to conserve cash. The company said after the market closed Monday it was cutting its quarterly dividend 82 percent to 3 cents. It also said it plans to sell stock and debt to help reduce annual costs by more than $2.4 billion. Alcoa fell 59 cents, or 9.6 percent, to $5.53. Apple jumped $1.80, or 1.9 percent, to $97.22. Dell rose 27 cents, or 3 percent, to $9.17. Bond prices were mixed. The yield on the benchmark 10-year Treasury note, which moves opposite its price, rose to 2.99 percent from 2.96 percent late Monday. The yield on the three-month T-bill, considered one of the safest investments, was flat at 0.23 percent. Light, sweet crude rose $1.62 to $48.97 a barrel on the New York Mercantile Exchange. Overseas, Japan's Nikkei stock jumped 3.2 percent. Britain's FTSE 100 fell 0.2 percent, Germany's DAX index declined 1.4 percent, and France's CAC-40 fell 0.9 percent.